The Reyland Track Plus 330 front brake conversion features 4-piston AP Racing CP5200 calipers, two-piece 330x28mm AP Racing discs and Reyland mounting brackets and bells. The kit is supplied with all required parts including discs, pads, bolts, brackets, braided brake hoses and unions. 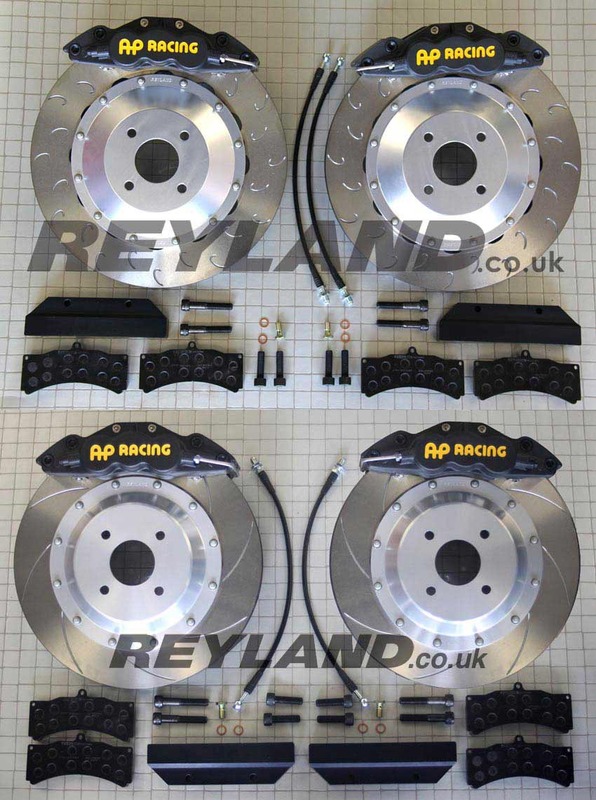 The Reyland Pro front brake conversion features 6-piston AP Racing CP9040 calipers, two-piece Reyland precision ground discs and Reyland mounting brackets and bells. The kit is supplied with all required parts including discs, pads, bolts, brackets, braided brake hoses and unions. Floating disc to bell mounting is optional.Spacers will be needed if using the OE wheel. The Reyland Pro front brake conversion features 6-piston AP Racing CP9040 calipers, two-piece AP Racing discs and Reyland mounting brackets and bells. The kit is supplied with all required parts including discs, pads, bolts, brackets, braided brake hoses and unions. Floating disc to bell mounting is optional. Spacers will be required if using the OE wheels. Disc surface options: Curved grooves. The Reyland Pro Plus front brake conversion features 6-piston AP Racing CP5555 calipers, two-piece AP Racing discs and Reyland billet alloy mounting brackets and bells. The kit is supplied with all required parts including discs, pads, bolts, brackets, braided brake hoses and unions. Kit pictured shows 4 stud bells, the kit supplied would have the correct 5 stud pattern. The Reyland sport rear 2 piece disc kit is designed to replace the original 302x18mm one piece disc. The rotor size is identical. Kit price includes pads. The kit is supplied with billet CNC machined anodised alloy bells bolted and torqued up to the rotors. Minor (2 minute job!) modification is needed to the inside of the caliper carrier, we will provide info or do the job free if you send your caliper carriers to us.